Can’t Turn off Find My iPhone (FMI)? Learn to fix! 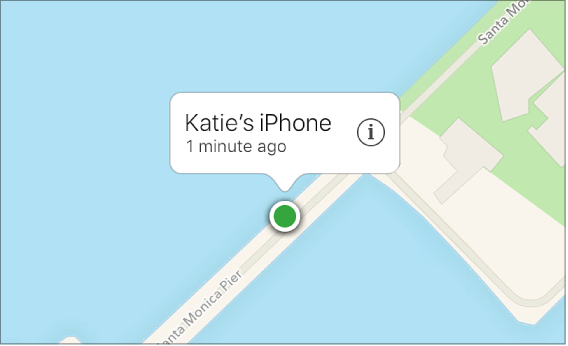 Someone stole my iPhone, how can I track it? It’s really frustrating! Please help! Any suggestions would be much appreciated! Losing a valuable possession can be quite heartbreaking; it is particularly painful if the lost (or stolen) item is your iPhone. Apart from the cost of the phone, all your contacts, lists, and personal data which make up a good chunk of your everyday life are gone. Here we made a guideline on how to track a stolen iPhone, or wipe/lock it down, so as to protect your personal data. Find My iPhone is the only official Apple app which makes use of the iCloud services to track stolen iPhone. 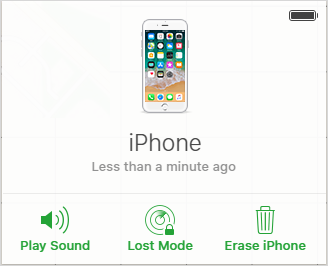 It is therefore important to set up Find My iPhone on your device so that you can use it to discover the location of your phone, remotely lock the phone, password it, or even remotely erase its data, if it goes missing. This app is free, and accessible on iPad, Mac, Apple Watch, and any browsers. so you can easily track your missing phone. Step 1. 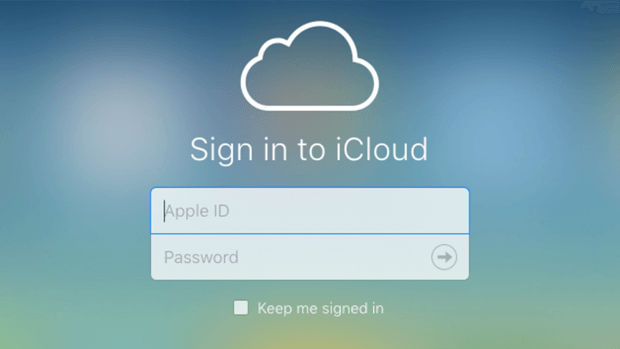 On a computer or phone, open iCloud.com. Enter your Apple ID and password. Step 2. Select Find iPhone, click on the lost device, and select it to view its location. (A green dot will indicate located devices on the map). Step 3. 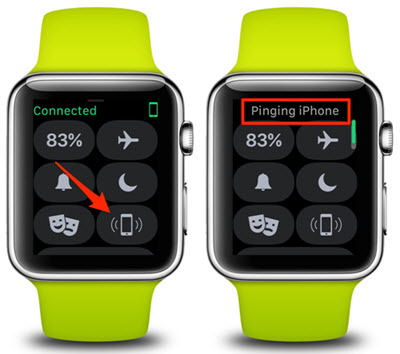 When you select the device, it zooms into the location and allows you to Play Sound (to help you or someone around you find it), activate Lost Mode, or wipe your iPhone. Step 4. If you are unable to recover the phone, then turn on Lost Mode. By doing this, you can remotely lock your iDevice using a password, and create a custom message with your number attached to it for the person who finds the device. When you lock the phone, it still continues to display its location; so hopefully, you are still able to find it. Step 1. Click the Digital Crown of the watch, to display the face. Step 2. Swipe up the display from the bottom. This brings up the Apple Watch Control Center. Step 3. Click the Find iPhone button at the bottom right corner. (It is the iPhone-like icon with audio waves by its sides). Step 4. Tapping the icon will begin to make your phone make a ping sound in full volume, even if it was originally on silent mode. You might have to keep tapping the icon to send multiple pings, until you locate your phone. You can also tap and hold the Find iPhone icon to make your iPhone’s led light flash alongside the ping sound, so you can easily locate where it is. Securing your privacy is very important. It is expedient that you erase the data (credit cards, and other personal information) on your device to avoid privacy leak. One very effective way to do this is by using the iMyFone Umate Pro. It is a dynamic iPhone data eraser that provides quick, effective and easy means of erasing data from your phone. 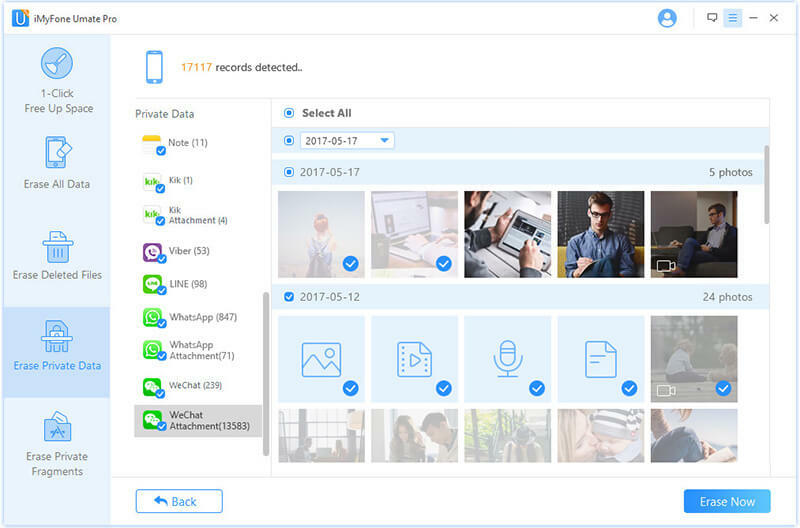 It comes with amazing features that will help you erase all the information on your device easily, and quickly, so as to avoid unauthorized access to your personal data. Secure your privacy by erasing sensitive data and information permanently, without a chance of recovery. 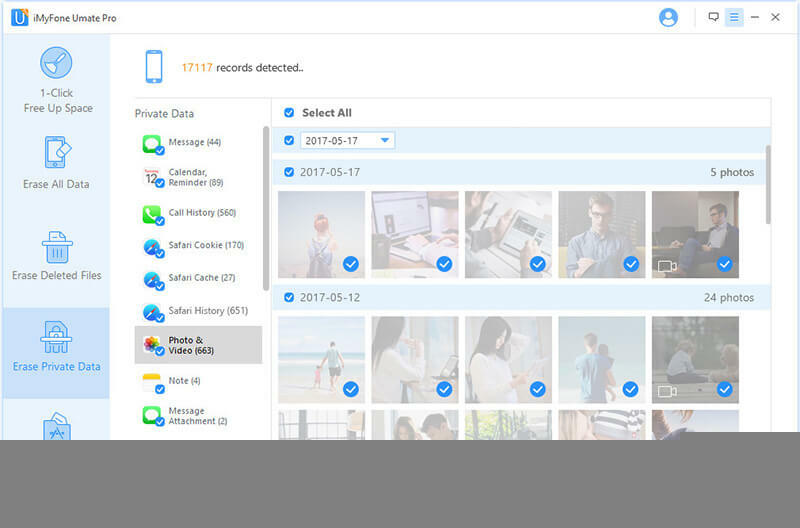 Protect personal data like messages, call history, pictures and videos, browsing data, contacts, etc. Preview and erase previously deleted data 100%, without any chance of recovery whatsoever, even with a recovery tool. 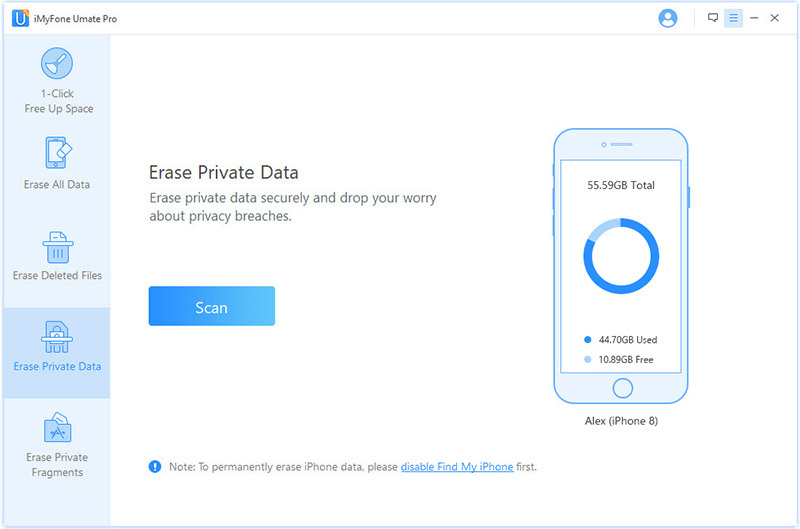 Delete messages, attachments, and files from third-party apps like LINE, Viber, WeChat, Kik, WhatsApp, and 10+ others. Step 1. Launch iMyFone Umate Pro on your computer and connect your iPhone to it. Step 2. Navigate to the Erase Private Data” tab. Tap the Scan button. Step 3. After scanning, you will see a list of all your private data like pictures, videos, contacts, messages, etc. Step 4. Select the files you want to delete, and then press the Erase Now button. Step 5. Select your Security levels, and afterward type in “delete” into the provided box to confirm. Step 6. 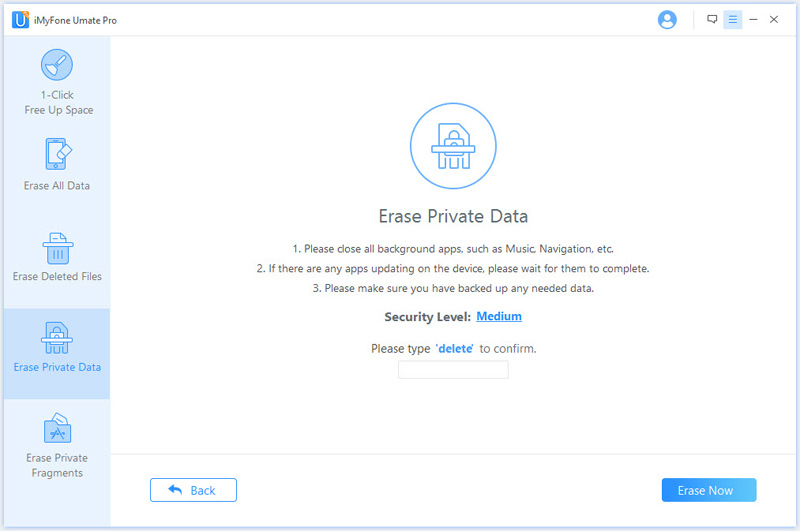 Tab Erase Now to begin erasing your private data from your device.